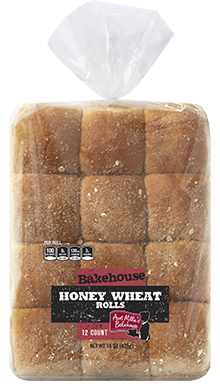 A great flavor is what you will get in this Honey Wheat roll. 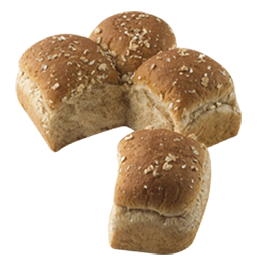 Each roll is 1.25 ounce and is great served by the basked or by the piece. 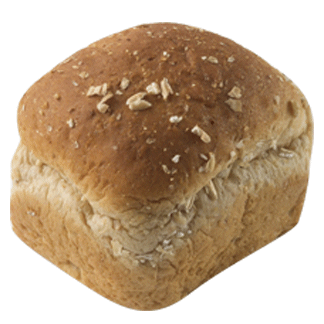 ENRICHED FLOUR [UNBLEACHED WHEAT FLOUR, MALTED BARLEY FLOUR, REDUCED IRON, THIAMINE MONONITRATE (VITAMIN B1), RIBOFLAVIN (VITAMIN B2), NIACIN (VITAMIN B3), FOLIC ACID], WATER, WHOLE GRAIN WHEAT FLOUR, YEAST, SUGAR, HONEY, WHEAT GLUTEN, SOYBEAN OIL, POTATO FLAKES, WHEAT BRAN, SALT, MOLASSES, MODIFIED WHEY, MONOGLYCERIDES, SODIUM STEAROYL LACTYLATE, CALCIUM PROPIONATE (A PRESERVATIVE), CARAMEL COLOR, VINEGAR, CALCIUM SULFATE, CITRIC ACID, ASCORBIC ACID; TOPPED WITH WHITE WHEAT BRAN.